How Much Compensation Can i Claim For A KFC Accident? Do you have a case for a KFC accident claim?, If you have had an accident or injury at KFC, you could be entitled to compensation. Read on to find out how you can make a no win, no fee claim for the compensation you deserve. A guide to KFC accident claims. An accident at KFC – What are the main types? Fast food restaurant health and safety considerations for your accident at KFC claim. A guide for slips, trips and fall KFC injuries. You’ve got a KFC burn Injury. Can you claim? Illness caused by food poisoning in KFC or by substandard food and drinks. What can you claim for after an accident at KFC? Claim for your KFC accident on a no win, no fee basis. How much can you claim for your KFC accident? Why choose us for your KFC accident claim? Call us for free advice and to start your KFC accident claim. The amount of compensation you can receive for a KFC accident claim all depends on the severity and nature of your injury or illness. There have been countless successful claimants of both customers and employees over the years, who have received compensation for accident in KFC. Some KFC accident claims have been as high as £5.1 million. Cases such such as these where compensation is so high are extremely severe. Should your KFC accident claim be successful you can expect to receive between £700 and £166 500 depending on both the severity and bodily location of the injury. For example, an individual who has suffered moderate head trauma will be able to make a claim for a significantly higher amount than someone who has suffered a mild hand injury. According to the BBC, there has recently been a substantial rise in the amount of Brits dining out in the UK. During 2016, the fast food service dramatically rose by 34.1%, and as of July 2017, there were 56638 fast food outlets in England alone. This amounts to over one quarter of England’s food outlets. With such a dramatic rise of fast food restaurants in the country, KFC accident claims are naturally becoming more and more common. While we are constantly being bombarded with warnings of how fast food is bad for our overall health. The aspect of personal injuries being inflicted on customers and employees during their time at these restaurants is often overlooked, meaning it is not often you will hear about KFC accident claims on the news. This is surprising considering that during 2011/2012 HSE received more than 4700 reports of injuries in the food and drink manufacturing industry alone. As many as 17% of these were considered major injuries and 83% resulted in more than a 3 day absence off work. As you can imagine, this would have created significant financial implications for many of these victims. Food poisoning in KFC is not as rare as you may think. During 2015, the FSA and Food Standards of Scotland investigated 1514 incidents in the UK relating to food, feed and environmental contamination. The main contributors to these incidents were allergens, pathogenic micro-organisms, residues of veterinary medicinal products and chemical contaminations. You can read more a more detailed analysis of these incidents through the link at the bottom of the page. With all these statistics in mind, you can begin to gage the amount of unsuspecting people have an accident at KFC or fall victim to food-related illnesses at KFC every year, ultimately resulting in KFC accident claims. Even though at times it may seem like there is no specific individual at fault for an injury, it is still the company’s legal responsibility to protect its customers and staff by ensuring that appropriate safeguards are in place. For these reasons, it can sometimes be difficult to know whether or not you are legally entitled to make a KFC accident claim for compensation. If you are unsure about your entitlement to make a compensation claim for your KFC accident or illness, please contact us to discuss the details of your injury and we will be happy to help, free of charge. You will also be able to find useful information through the links below. These are just a few of the examples of the responsibilities of the owners of food establishments. Health and safety regulations require facilities to be properly and adequately maintained. Where a customer or member of staff are injured due to the lack of proper maintenance, they are perfectly within their legal rights to make a KFC accident claim. Should they have an accident at KFC, staff members are entitled to claim for compensation as much as customers and visitors of the establishment are. While members of staff may be able to claim workers compensation or file for a liability claim, a customer or visitor would claim for damage caused by an accident or illness. If you can relate to any of these injuries or illnesses, read on to find out further information to begin the process of claiming the compensation you deserve. If you are unsure whether or not you are eligible for compensation for your accident at KFC claim, there are some helpful points to consider. While there are generally different types of compensation for employees than there are for visitors, the baseline rules remain the same. In accordance with Occupiers Liability act of 1957, it remains the duty of the owner or occupier of an establishment to provide a duty of care for their visitors and employees. They are required by law to ensure that all reasonable measures are put in place to avoid accidents and illnesses being inflicted on visitors and employees of their establishment. If the rules are not followed, a KFC accident claim may not be far behind. These rules extend to ensuring that all staff members are given proper training for their jobs, whether they are managers, cooks, or cleaners. Each of these members of staff are given a responsibility by their employers to do their jobs in a safe and efficient manner and as such, adequate training is of the utmost importance. Training is the responsibility of the restaurant owner. Even if the owner passes the responsibility of training onto their manager, the owner is still liable and responsible. This is because it remains the owner’s responsibility to ensure that the manager is adequately trained, in order for them to train other employees. Slippery floors are common in fast food restaurants as drinks are regularly spilled by customers and members of staff, causing unfortunate slips, trips and fall KFC injuries. If a drink or food item is spilled or dropped on the floor, it is the owner’s responsibility to make sure that cleaning staff are looking out for these mishaps and consistently cleaning up any mess. This however, can also cause problems in itself as mopping a floor will make it wet and slippery. It is vital that both customers and staff alike are made aware of the potential danger through the means of a wet or slippery floor sign to avoid injuries that result in a KFC accident claim. Slips, trips and fall KFC injuries can also be the result of broken flooring or furniture, or even a pot hole in the car park. Fixing these should be high on the owner’s list of priorities. Leaving these dangers in place is negligent and the owner is guilty of not complying with the occupiers liability act of 1957. Another cause for falling, which may get overlooked by some people, is accidents caused by poor lighting, potentially restricting the visibility of staff members and customers. This can be particularly dangerous for those who are cooking or serving food and drinks. A KFC burn injury can be a result of very hot food of beverages. Burn injuries like these could cause serious pain and complications for the consumer, whether they are a customer or staff member. KFC owners have the duty of ensuring their employees are cooking and serving the food and beverages in a safe manner and this extends to ensuring the temperature is not too high. Relating to the previous section, if someone in the establishment trips with a very hot cup of coffee, and the hot coffee lands on someone’s face, this is likely to result in a serious KFC burn injury. Burns, as you can imagine, are often caused in kitchen areas. This can be more likely to happen where kitchens are cluttered and untidy, where the cooking staff have not been given sufficient training, or where the ovens and grills are faulty or damaged, all of which the liability lies with the owner. How can we ever be sure of the quality of food we are served while dining at a restaurant? Customers trust that the food in these restaurants is correctly and hygienically prepared, but what happens when it is not? A KFC accident claim is imminent. Stale or undercooked food can cause a variety of unpleasant illnesses, which can lead to significant time off work and even land you in hospital. These cases are caused by restaurant negligence. If you are unlucky enough to get food poisoning in KFC, whether you are a visitor or member of staff, you are liable to claim compensation. Staff members may be eligible for workplace accident compensation, should they get ill by eating the food themselves. Food poisoning is particularly dangerous for young children, elderly people and those who have an existing illness that causes them to have a weak immune system. There have even been countless cases of death caused by food poisoning which is why of KFC restaurants need to ensure that staff members are storing, handling and cooking the food correctly, safely and hygienically. Practising these standard but highly important procedures will minimise the number of people who get food poisoning in KFC. It is important to note the different costs and expenses a KFC accident claim can be made for. In the extreme case of a death, for example, claims can be made for the time period between the accident and the death. If an individual has been told they have several weeks or even months to live after suffering a head injury in KFC, they may be entitled to claim for mental anguish, loss of amenities, and for any disabilities they are likely to suffer before their death. You can make a KFC accident claim for mental anguish. This is related to the fear an individual has for their life or their quality of life as a result of their injury. This can also be the case for a parent of an injured child. Psychological damage after an accident includes aspects such as feeling an inability to cope with life in general, vulnerability and the effect the accident has on the individuals relationships. Psychological damage can also include illnesses such as Post Traumatic Stress Disorder. Loss of earnings and future loss of earnings is a big worry for many individuals who have suffered an accident. If this applies to you it is likely you are eligible to claim compensation for accident in KFC, to cover any loss or future loss of earnings as a result of your accident and the restaurants negligence. For many people who have had an accident, not only will their quality of life be impaired, but they may also require a carer to look after them and ensure their safety. Whether this be short term or long term, it is likely that these victims will be eligible to claim for their care costs. Other costs may include travel expenses and personal possessions. No win, no fee for your KFC accident claim means exactly what it says. If you do not win your compensation claim, you will not have to pay a penny. This is great news for our clients who are able to get specialist legal advice from our highly experienced solicitors, without any upfront costs. Also known as Conditioning Fee Agreements (CFA), no win, no fee claims have become widely popular in recent years. They allow individuals to claim the compensation they are entitled to, even if they have limited funds. It makes the process of pursuing your KFC accident claim fairer for everyone involved so that accident claims are not restricted to those who have the means to be able to afford the costly process of a court procedure. You will need to discuss your intended KFC accident claim with one of our friendly solicitors, giving details of your accident, injury or illness, and how it has effected you and your life. After this, we can discuss whether you have a case for making a KFC accident claim for compensation. Should your solicitor decide to take on your case, you will be made aware of the fees which will be taken from your compensation if your case is won. Your solicitor will pursue your case, keeping you updated and involved as much as possible. They will do this, handling all legal aspects of your case without you having to pay anything. In order to make a claim for 100% compensation, which means that you do not pay any fees at any time even if you win your case, you would need an insurance policy that covers legal costs. In these cases, the insurance company pays all of the fees associated with your legal case. 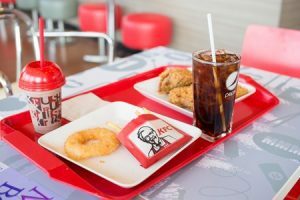 An accident at KFC claim can be broken down into categories that will give you an approximate guide to how much compensation you may actually be able to receive for each injury and the severity of that injury. Foot injury Mild Up to £10 450 Victim will have a simple foot injury such as a fracture or lacerations. There may be instances such as a permanent limp where the higher end of the amount may be claimed. Foot injury Moderate £10 450 - £19 000 There may be permanent dis-figuration or more serious fractures. The risk of of future complications will be likely. Foot injury Serious £19 000 - £29 800 Victim will suffer from long-term pain and probable future complications. They will have arthritis or will likely develop arthritis in time. Mobility is considerably restricted from damage to both feet. Victim will likely need extensive surgery and be in considerable, long-term pain. Knee injury Moderate £11 275 - £19 000 Injury involves torn cartilage, dislocation, or possible future mild complications. There will likely be pain. Knee injury Severe £19 900 - £73 125 Victim will have long-term, persistent pain and discomfort, in addition to considerable damage and loss of function. Leg injury Moderate £21 100 - £29 800 Limited ability to move a joint, significant scarring and significant impact on life in general. A high risk of future complications and surgery. Leg injury Severe £73 150 - £103 250 Extensive procedures such as bone grafting and degloving of the leg are undertaken. Hand injury Mild £700 - £3300 Victim will have short term damages such as mildly reduced function. They will have a quick recovery, usually within several months. Hand injury Moderate £4100 - £10 000 There will be long-term, significantly reduced function. Hand injury Severe £22 050 - £47 050 Hand function will be reduced to half the capacity. Fingers may be amputated and hand may be clawed. Minimal or no damage to the brain, relatively quick recovery and mostly mild external damage. head injury Moderate £32 725 - £166 500 Brain damage has occurred and speech or other senses are impaired. Memory and intellect can also be reduced. The above table is a only a guide to give you an estimation of what you can expect from your KFC accident claim based on your injury. It is not possible to give specific figures as each case varies significantly, some being very complex. For a more detailed and definitive idea of how much compensation you can expect to receive for your KFC accident claim, please give us a call. The thought of entering a legal battle can be daunting, but we offer a friendly and professional service and we will be right here for you every step of the way throughout your KFC accident claim. With our unique approach to compensation claims, you will never feel like you are in this alone. For your KFC accident claim, we can arrange services that could strongly help your case such as independent medical examinations. Medical examinations are an important aspect of personal injury cases. They are the foundation on which your case is built. Combining these with our legal expertise, we will build your case and help ensure you receive the compensation you deserve. Our no win, no fee policy extends to the independent medical examinations, so you really will not have to worry about any costs until your case is won. If you have suffered an accident, give us a call and we will be more than happy to discuss your accident at KFC claim with you. We will offer you free legal advice and begin pursuing your case as soon as possible. Don’t delay. With KFC accident claims it is best to begin as soon as possible. You can call us on 0800 073 8804 for your free consultation with an expert solicitor today. Legal Expert guide to no win, no fee. Details of the FSA annual report of food and contamination incidents that was published in 2015. Here’s what the government website says about claiming compensation after an accident or injury. The Health and Safety Executive website which explains what to do if you suffer from a slip or fall when at work. The NHS has some useful guidance about diagnosing food poisoning and when you should seek medical advice. Find out more about how we deal with the slip trip or fall accidents in fast food restaurants. Our guide for claiming compensation after an injury caused by defective work equipment.